Pigs cannot write poems because. Of course, Ciardi is completely off the mark here. Poetically conservative critics, like Ciardi, have been labelling the Beat writers ignorant swine for decades. And that’s to say nothing of what feminist critics have labelled the Beats. In addition, as E.B. White documented in Charlotte’s Web, pigs have been poets for quite some time. The poem below was found in Wilbur’s (not Richard) uncollected writings. Some pig! This poem failed to make the pages of Charlotte’s Web and cannot be authenticated. Possibly only a publisher, like Ed Sanders, unscrupulous enough to announce that he would publish anything would dare touch it. In any case, you could argue that Charlotte probably ghost wrote the poem anyway. While working at the store, I became obsessed with Doodle Soup. One day I could not take it anymore and I bought a copy. It now sits on my rare book shelf, and it is one of the quirky items that fills out my Burroughs collection. Seemingly nothing could be further from the Burroughsian, but Doodle Soup in my paranoia fits in quite nicely right next to my Olympia Naked Lunch and my Big Tables. Madness?? Not really. As I said Burroughs is everywhere. Ciardi graduated from Tufts University in 1938 and became a prominent member of a circle of poets who, like Robert Lowell, were centered in Cambridge/Boston, a place that dominated the immediate post-WWII poetry scene. Several of them were collected in the Mid-Century American Poets anthology of 1950. In a related side note, another practicioner of children’s verse, X.J. Kennedy, also had ties to Tufts. Kennedy taught there in the early 1960s and my father took his course as an undergraduate English major. According to my father, Kennedy often brought poets from the Cambridge circle into the classroom for reading and discussion. Readers of a certain age are probably very familiar with Kennedy without even knowing it. There is a good chance that Kennedy introduced you to poetry. Kennedy edits several Introduction to Poetry textbooks used in high schools and colleges across the United States. The textbooks indoctrinate young readers into a rather conservative reading of poetic tradition. With the rise of New Formalism, these books have come back into favor. This theme of instructing the young in acceptable literature and protecting them from the disreputable comes into play with Naked Lunch and Ciardi. By the way, try reading the anthologies of Jerome Rothenberg for a healthy counterbalance to the established literary tradition. In the 1950s Ciardi served as poetry editor for the Saturday Review, a weekly magazine. The magazine is largely forgotten now, but in its heyday, it was a rival to the New Yorker as an example of the literary mainstream. To be published in the New Yorker and Saturday Review was to make it to the big leagues as a writer. This is not to say that it was the only game in town. Take the Cambridge of Lowell and Ciardi. Shortly after mid-Century an alternative scene developed. Cid Corman of Origin, Jack Spicer, Joe Dunn of White Rabbit Press, Stephen Jonas, Robin Blaser, Charles Olson and Robert Creeley formed the core of the Boston Renaissance of the mid-to-late 1950s. The term Renaissance links Boston to a similar literary awakening that was occurring at the same time in San Francisco. Spicer and Blaser were members of the earlier (and largely overlooked) Berkeley Renaissance of the 1940s that made the much more publicized San Francisco Scene possible. Of course, Burroughs has Boston ties. As a graduate of Harvard, Burroughs was one of the elite gone to seed. 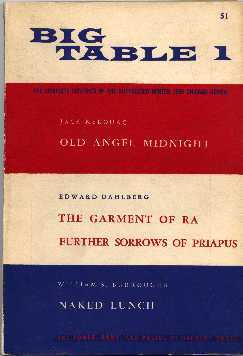 A Satanic figure, Burroughs fit in with a host of degenerate angels who revolted against the kingdom of heaven. In the literary world, that kingdom was academic verse and the tenets of New Criticism. Ciardi was one of the elect. In the introduction to At the Front, the point is made that the early critical reception of Burroughs revolved around legal questions. As a result, Burroughs and Naked Lunch had to demonstrate a moral purpose. As I have argued in my Kulchur piece, this is unfortunate, since robbing Burroughs and Naked Lunch of their obscenity and their offensiveness lessens them both in my mind. Readers get robbed as well. To me, the sensation of being shocked and offended is very invigorating. I relish that feeling of shock that accompanied my first reading of Naked Lunch. Ciardi would be associated with Naked Lunch years after his article. It should be noted that Ciardi’s Wikipedia page fails to mention Ciardi’s pivotal role in the reception of Naked Lunch. The section on Naked Lunch from Ciardi’s review appeared on the dust jacket flap to the Olympia Press version of Naked Lunch. The strange reference to Dante and vulgar language on the flap comes from the fact that Ciardi translated The Divine Comedy and was an expert on the Italian writer. Ciardi was asked to defend Naked Lunch at the Big Table trial. He declined at that time, but he did speak on behalf of the novel during the Boston trial that followed the book’s release by Grove Press. Norman Mailer and Allen Ginsberg also appeared on the stand to give their two cents. Burroughs stayed clear of the trial. No doubt it was determined that his reputation would precede him and would cloud the issues at hand with questions of murder, homosexuality and drug abuse. Ciardi’s presence mirrored the presence of Mark Schorer on behalf of Howl nearly a decade earlier. Schorer was a noted academic at the University of California. He wrote the definitive biography on Sinclair Lewis a few years after the Howl trial. If Schorer represented the San Francisco literary establishment, Ciardi served the same purpose in Boston. He had been an esteemed member of the Cambridge poets. In fact, it is interesting that it was in Boston that Naked Lunch went on trial. The phrase “Banned in Boston” has become a cliché. The city’s Puritian tradition makes Boston ever watchful of any type of obscenity. 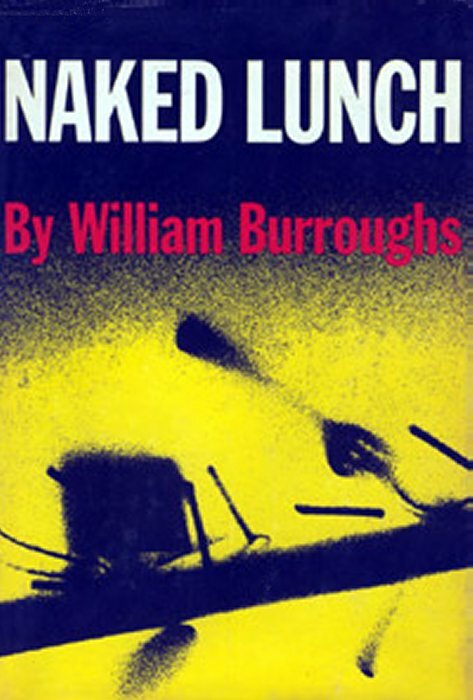 In vulgarity, Naked Lunch would seem offensive to that tradition, but more interesting to me is the fact that Burroughs and Naked Lunch challenged the literary tradition that eminated out of Boston not just in the 1650s (Purtians) or 1850s (Trancendentalists), but in the 1950s. In Ciardi’s distrust of the official, the then-recent McCarthy hearings come to mind. I can easily see his horror of the book burners. Heine wrote: “Wherever they burn books they will also, in the end, burn human beings.” The Holocaust was only a decade in the rear-view mirror. But I am particularly pleased with Ciardi’s distrust of the Sweet Sixteen mentality. The restriction of the freedom of adults in the name of protecting children infuriates me and this manuever has been used by forces of control as a means to extend their influence seemingly forever. It upset Ciardi as well and it makes me appreciate his book of children’s verse, Doodle Soup, all the more. Doodle Soup may be child’s play for Ciardi, but his appreciation for literature, including Naked Lunch, is not. It is serious play. It is strange how a book and a poet on the surface so removed from Naked Lunch can relate to it with such force and complexity. As a result, Doodle Soup belongs on my shelf next to my Olympia Naked Lunch. This sense of paranoia that surrounds Burroughs is part of Burroughs’ charm for me. Maybe the entire post-WWII era is Burroughsian. Remember: just because he is invisible does not mean he is not there. Written by Jed Birmingham and published by RealityStudio on 9 June 2008.